The Durian, (Durio zibethinus) is often referred to as “the King of Tropical Fruit” and with good reason. As well as being extraordinarily delicious to eat, it is bursting with natural vitamins, minerals, protein, unsaturated fats and of course calories! 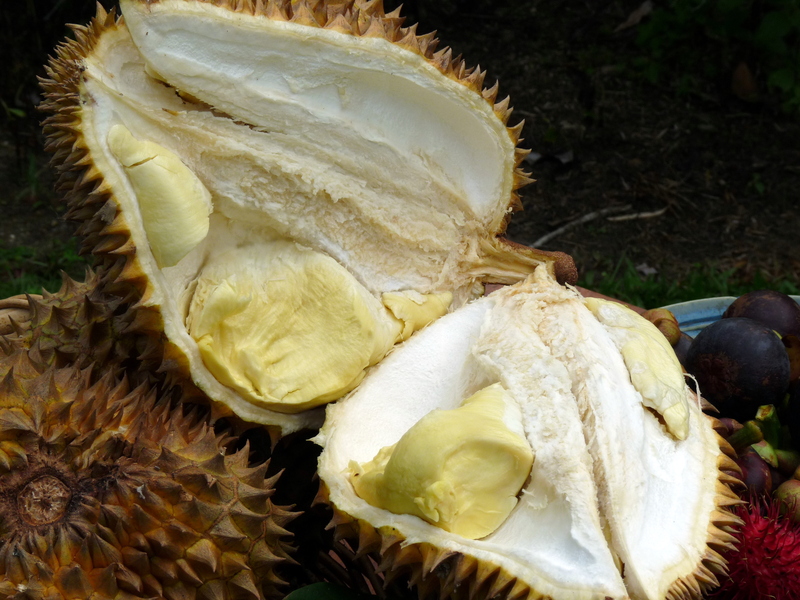 It is without any doubt my absolutely favourite fruit and this is the first year we have had a substantial crop – we have been eating some Durian every day for the past 8 weeks, I have frozen many kilos and given away lots to friends. I took this fruit to an outside table in order to photograph it and within seconds this little butterfly was attracted to the strong fruit odour. 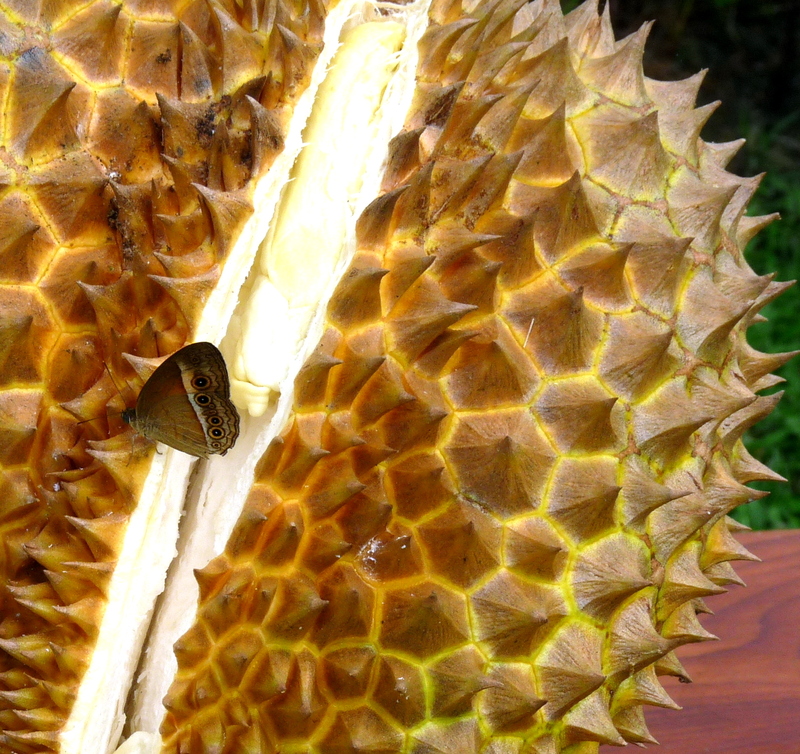 (I think the butterfly belongs to the Mycalesis genus, one of the bush-browns) The Durian fruit, as you can see, has some seriously sharp, stout spines which offer quite a challenge to those trying to access the sweet, rich custardy flesh within. The fruit is a capsule and when ripe it splits into irregular segments containing the seed which is embedded in a rich cream or yellow coloured pulp ……and that’s the yummy bit. Like many other fruit growers in Far North of Queensland this year, we have a huge crop of Mangosteen (Garcinia mangostana) which is known as the “Queen of tropical fruits”, and it is keeping us very busy picking and sorting for sale. Like Durian it is native to the Malaysian rainforests but there the similarities end. 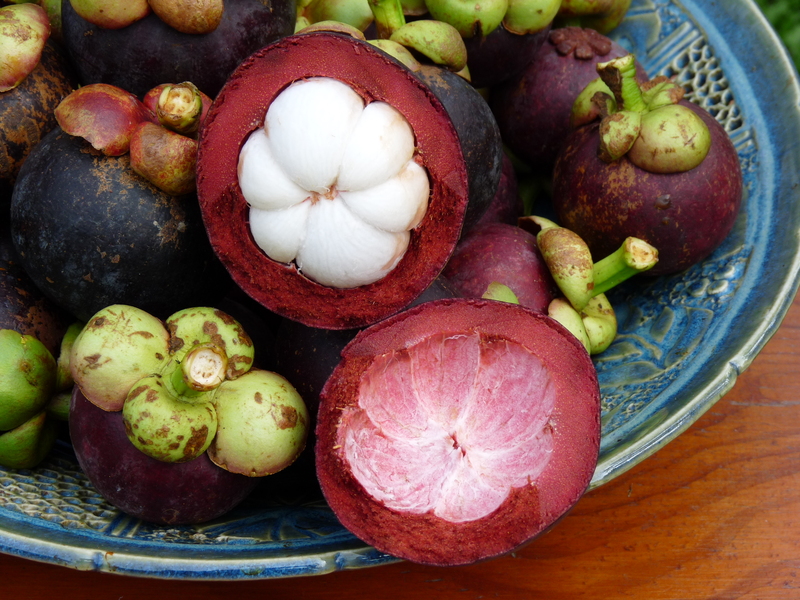 The flavour of the white, translucent flesh of Mangosteen is ‘melt in the mouth’ delicate, sweet and refreshing. The other fruit in the photo is Rambutan (closely related to Lychee) and although we have harvested a few fruit for ourselves and friends most of it is being enjoyed by Sulphur-crested Cockatoos and Rainbow Lorikeets. As we have more than enough fruit to eat we don’t mind sharing with them. And just to finish up – one more photo of the Durian showing its creamy, delicious segments. This entry was posted in Exotic Fruit and tagged Durian, Mangosteen, Rambutan, Tropical Fruit. Bookmark the permalink. 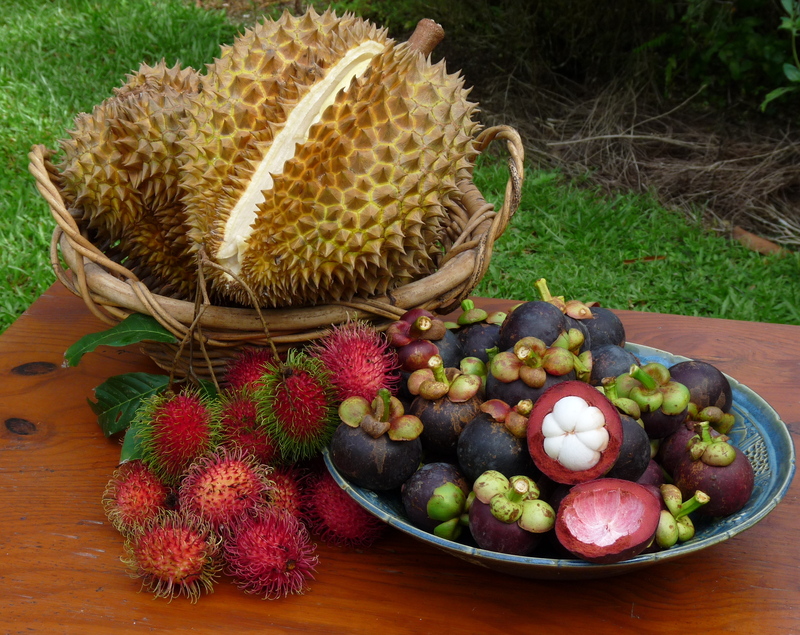 Keep the durians, but those mangosteens … yum! Oh Snail……have you been put off by the fruity aroma or don’t you like the taste? What a great collection of fruit. Personally I vote for the Rambutan as the best. WRT to Durian it is good that smells can’t be attached to posts! I have been told that it is illegal to carry one on public transport in Jakarta! Well the odd thing about the Durian aroma is that when you enjoy Durian, the smell is deliciously rich and fruity and it is hard to understand why people are put off. I don’t know any of those fruits but they all sound yummy! I’ve never yet found a fruit I don’t like! Well Mick you have to put up with some heat and humidity in order to grow these beauties – they’re our rewards! Oh yum! I am going to Cairns next Easter. Could you pls tell me where I can buy these delicious fruit? Thanks! Try going to Rusty’s Markets in Cairns where you will find a selection of fruit in season – you might be lucky!